What is a "Survival Kit"? The "kit" part refers to a collection of items, usually packaged in a readily accessible, easily transported, container. Survival? While out in the woods (or even sitting in your chair at the office) something unexpected might happen which puts your life at increased risk; "survival" is getting through such an event alive and in as good a condition as is practical. - EDC (Every Day Carry) is what you have with you "at all times". Generally this is an exception to the packaging implication of a kit, and these tend to be items you use "every day"
bandana. All of these I often need for "normal" tasks, yet they have great potential in an emergency. Plus, I rarely use it, I always want to have a small lighter or other fire starting option. I normally wear a Scottevest with bunches of pockets, which holds several additional items. - Pocket kits fit into a pocket, by definition. Not one of those cargo pants pockets; we are talking a regular shirt pocket sized pocket. These kits usually are packaged in a small metal tin (such as mints come in) or a zippered vinyl envelope. Due to the size limitations, these are very bare bones, but can and should provide some critical elements for survival. 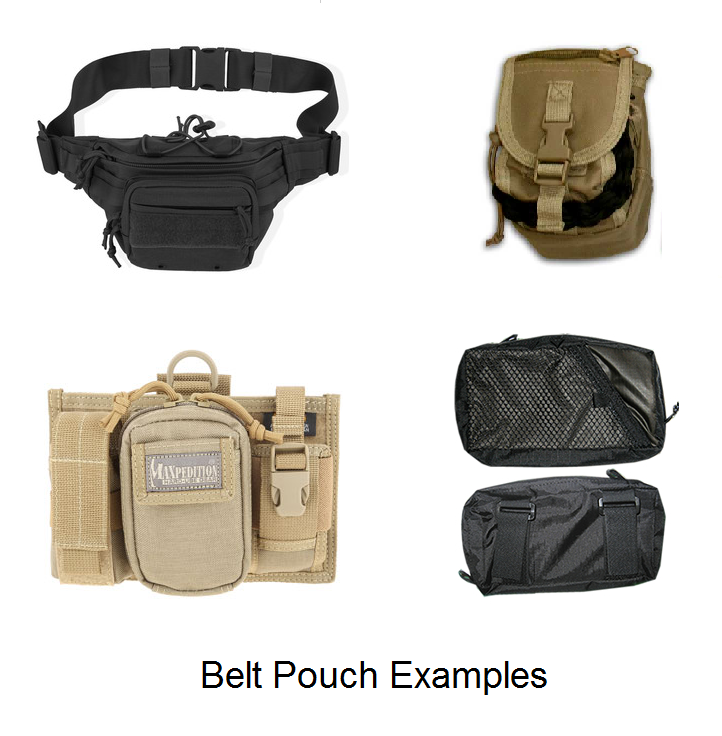 cargo pocket, in your pack or even distributed among the pockets of a multi-pocket vest. These can be fairly comprehensive, but still depend on what is available at the scene of the emergency, or within reach of that scene. There are bigger kit types, but they tend to be oriented towards "global" emergencies rather than the "personal" emergencies which these smaller kits are designed for. Despite being called a "rule", this is only a guide. If you fall into freezing water, it is highly unlikely you will last three hours. On the other hand, being dry, on land, in nice weather, you might last considerably longer than three hours. The purpose of this "rule" is to provide a GUIDE for survival priority. All these elements (and a few others) are critical for life; it is just that some are needed sooner than others to maintain that life. These are the priorities for staying alive; another key priority for one of these small kits is you usually want to be found and rescued, so signaling should be a priority right between shelter and water. 1. Pick the first time period (highest priority because it gives you the shortest length of time), 3 minutes. 2. Think of what can "defeat" the problem. 3. Reject things which obviously will not fit or would not be practical. For "no or contaminated air", obviously none of these kits will allow for a tank of air, or even a CBRN or "gas" mask. Consider things which would be of use and might fit. If there is really "no" air, you are SOL; but if there is contaminated air, you might benefit from a good filter mask (FFP3 or N99 - 99% filtration ratings) or the old western standard, a bandana, wetted if possible. 4. Consider if there is anything else which has a good chance of killing you in this time period. For instance, if you have serous (arterial) bleeding, 3 minutes is none too long. The bandana would help here as well, as will a length of rope, webbing or elastic tubing to facilitate making a tourniquet. 5. Add to the list of items, with approximate size/weight. Best would be if you actually have the item, you can lay it out and "see" how it might fit. If you don't have it, it is generally better for your finances to be pretty sure you are going to include an item before spending money on it. 6. Repeat for each additional time period, including the "1 - 2 day" period for rescue, meaning consideration of signaling options. 7. Once you have a "final" list, get any items you don't already have. 8. Attempt to pack the items. Weed out items which won't fit, or find smaller options, or consider a larger package, or combine items, or see if there is a more effective way of arranging things. 9. If there is space left, consider what to add, if anything (you don't HAVE to fill the container, but why not do so?). If you are looking at a pre-made kit, the decisions have already been made for you, but they are not and should not be final. It is wise to go through the analysis process to ensure that your priorities have been adequately met. For instance, do you have any medications which missing a few days of would cause significant problems? Is the whistle the best quality and most effective that will fit? There is no law or moral standard preventing you from adding to or even replacing items in a pre-made kit. That is a good thing, because I do extensive modifications to even the best kits I get. Keep in mind that you won't be able to fit "everything" into any of these types of kits, so you should always consider your immediate environment to be your "emergency shopping mall". That is, any survival kit should focus on those things which are most important and difficult to acquire "in the wild". Quality is important. Remember, your life may depend on the items in the kit. For instance, I have several keychain flashlights which cost a dollar or two (either they came out of pre-made kits or free with the order of something else), but whenever I build or modify a small survival kit, I fork out $15 for the best keychain light available (Photon Freedom Mk II Micro) because it is water resistant, rugged, has an exceptional run time, variable brightness, easily replaced batteries, can be packed so it cannot be turned on in storage, comes with a magnetic/clothing clip mount for hands free use, and will blink S-O-S. Well worth the additional money, even with several cheap ones already laying around. On the other hand, I don't put in the very best knives, which cost two to five times or more as almost as good knives. compensate somewhat for lack of shelter, and don't forget, you might be injured, you want an easy, reliable way to start a fire. The easiest ways to get a fire is to carry fire - a lighter or matches. Lighters can fail or have the fuel evaporate; matches can get damp or be used up; both have trouble with wind. Having a "Ferro-cerium rod" or "Spark-Lite" style spark generator as a backup is highly recommended. But of course, a spark is not yet a fire; you need "tinder" to coax a spark into flame. You can usually find tinder in the wild, but it might be difficult, particularly if the environment is wet. Having some "Tinder-Quik" or equivalent in your kit is helpful in these cases. Often a Fresnel lens is included as a further backup fire methodology as well as its magnification property. Not only is fire a key component of shelter, it also has applications for first aid, signaling, water and food, as well as protection from wild animals and even provides some psychological comfort in a stressful situation. Fire starting should never be where you skimp. Other aspects of shelter are a real problem for small kits. In a belt kit, you might be able to include a plastic sheet or tarp, and/or a Mylar "rescue blanket". Other than that, some rope can help you build a shelter from what is available in the environment. Paracord is preferred in a belt kit, but some high strength (150 pound or so) nylon cord can fit in smaller kits. Of course, it is a common misconception that "shelter" is used to protect you from wind and rain. It does, but the real enemy is the ground. Here is a hint - the ground is a LOT bigger than you, and in any thermodynamic contest, you WILL lose. It is better to have insulation from the ground than cover; best is to have both, built entirely or mostly from scrounged materials. use if you are staying put either because you are immobile, or where you are is a better environment than any other which is currently available. If you have to move, a compass can keep you moving in a straight line or the right direction if you know it. Water is not going to fit into any of these kits. Ways of getting water may fit. The most compact solution would be a heavy duty plastic bag and some water purification tablets (the bag should be sized to match the tablet capability; one liter is fairly standard). Other, larger, options are a small pan or cup to boil water, or a small filter such as the LifeStraw. Food is interesting. On the one hand, fitting a significant amount of food into any of these kits is a real challenge. On the other hand, a case could be made that since a person can last for three weeks without food, it should not be of any concern in small survival kits. There are two things wrong with attempting either approach - ways to get food in the wild are small and cheap, so leaving them out of any kit is silly, and although a person can LIVE for three weeks without food, it will be quite unpleasant, it will be fairly harmful to their health, and, perhaps most importantly, it will significantly decrease their ability to perform other, more critical, survival tasks. Therefore, most kits can, and should, include some wire for making small game snares, fishing line, hooks, and split shot sinkers for fishing. And toss in a needle with an eye big enough for the fish line for emergency sewing. After all, your clothing is part of “shelter”, and if it is ripped, it is not going to provide as much shelter as it could. Some safety pins are commonly included. 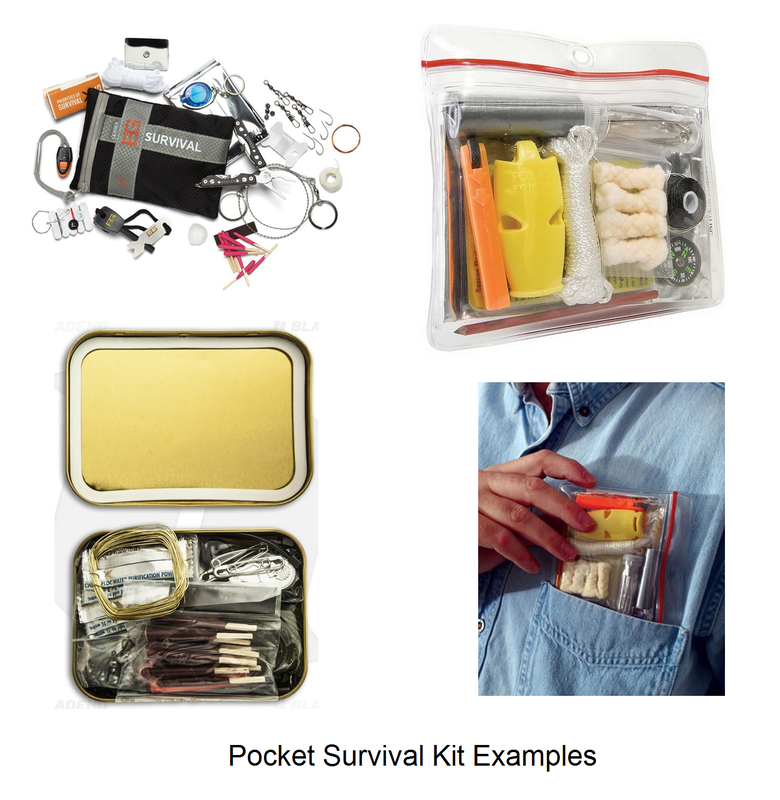 Other things commonly found in small survival kits, with multiple uses, are a few feet of duct tape (emergency repair, shelter building, even bandaging), a sheet of heavy duty aluminum foil (heat reflector, signaling, cooking), a pencil and some paper. Finally, most tasks will be easier if you have a cutting implement. If you routinely carry a good pocket knife or a multi-tool with a good knife blade, this might not be necessary. Otherwise, include the most effective cutting tool which will fit. For the smallest kits, this might be a scalpel blade, single edged razor blade, utility knife blade or most usable, a folding razor knife. Going up from there is a good folding knife or even a small fixed blade knife in the biggest kits. A good "wire saw", Sawzall blade or folding razor saw might be a useful addition.